This recipe is one that I’ve tucked into my “perfected” file. I basically cook a recipe over and over again, trying to simplify everything I can while making absolutely fantastic tasting food (taste always comes first though, I just save the time consuming dishes for weekends). 1. Pre-heat your over to 400. 2. 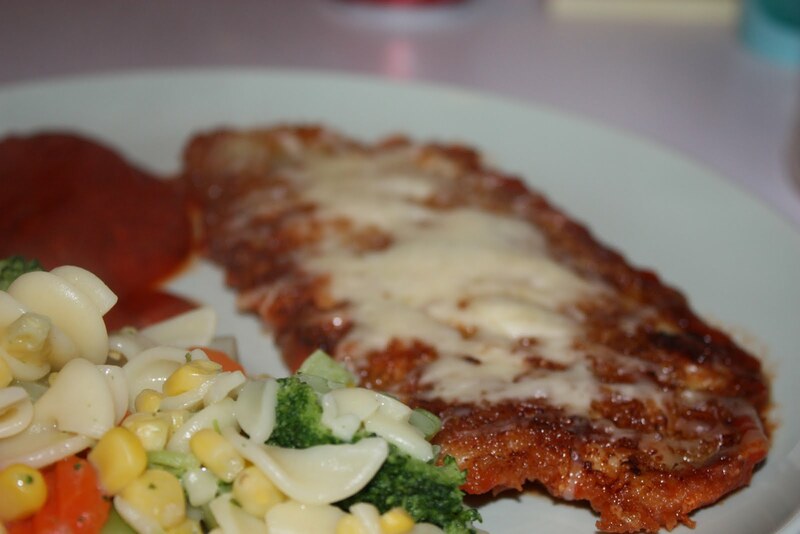 Put the bread crumbs and parmigiana cheese in a dish and mix well together. Put the egg in a second dish and whip up with a fork. 3. Dip each cutlet into the egg, and then put it into the bread crumb mixture. Make sure that they’ve evenly coated with crumbs. The panko crumbs won’t look as uniform as regular bread crumbs, but the crunch? Oh la! 4. Heat some olive oil in a large, non-stick skillet (about 1/8″ think coating). Make sure the oil it super hot, but not smoking. Look for it to start to shimmer on the surface, this is when you’re ready to rock! 5. Put the cutlets into the pan, carefully! Always start with the chicken hitting the pan closest to you, then drop it down towards the back, this way you don’t get splashed with boiling hot oil (trust me on this one). 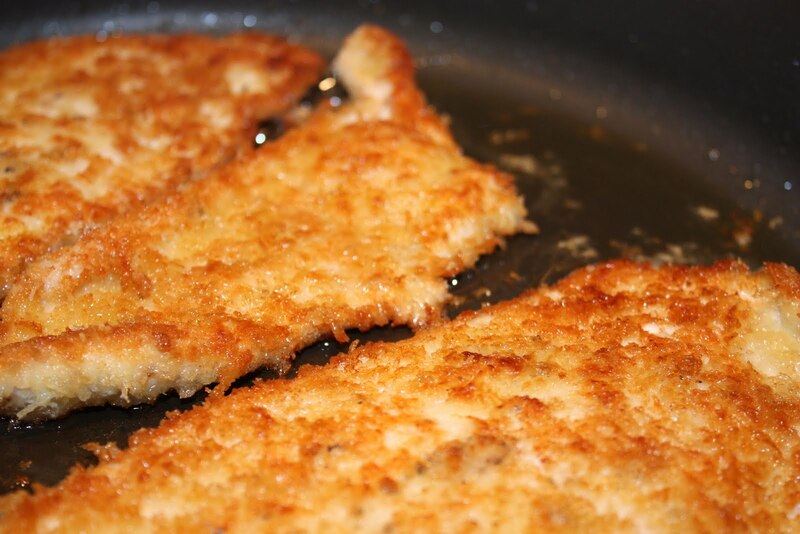 Cook each cutlet until well browned, about 3 or 4 minutes on each side over med-high heat. The best part about this, it’s totally ok to flip it back and forth a couple of times (I always do), to make sure it’s nice and brown! 6. As the turkey is cooking, pour your pasta sauce into a large rectangular baking dish. HINT: Line the dish with foil first, this makes for a really easy clean up! When the turkey is done, lay the cutlets in the sauce and then top each one with a sprinkle of the mozzarella cheese. Throw this puppy in the oven for 10 minutes, just until the cheese has melted and the sauce heated up. If you’re in a rush, you can throw it under the broiler and it’ll be ready in 3 – 5 minutes, just be careful that it doesn’t burn! NOTES: Don’t put any sauce on top of the cutlets, as this gets rid of that incredible crunch that the panko crumbs adds. Instead, when you serve, put a nice dollop of sauce on the side for dipping, and if you want to go all fancy drag your spoon through it on a curve to make a tail. If you want to make the scaloppini yourself, just butterfly a chicken breast, and then pound to 1/4″ thickness between two sheets of cling wrap. For the garlic pasta with vegetables: Go to your freezer isle, buy a bag for $2, pour it into a pot with 1/2 cup of water and crank the heat for 6 minutes. Delicious! 2. In a medium bowl mix together the flour, sugar, baking powder, baking soda, cinnamon and salt. 3. In a second, smaller bowl, mix together the egg, oil, yogurt and vanilla. Stir the wet mixture into the dry mixture until combined (It will seem quite stiff). 4. Mash the bananas in the bowl that the wet ingredients were in. Make sure that you mash them really well, then mix into the batter. 6. 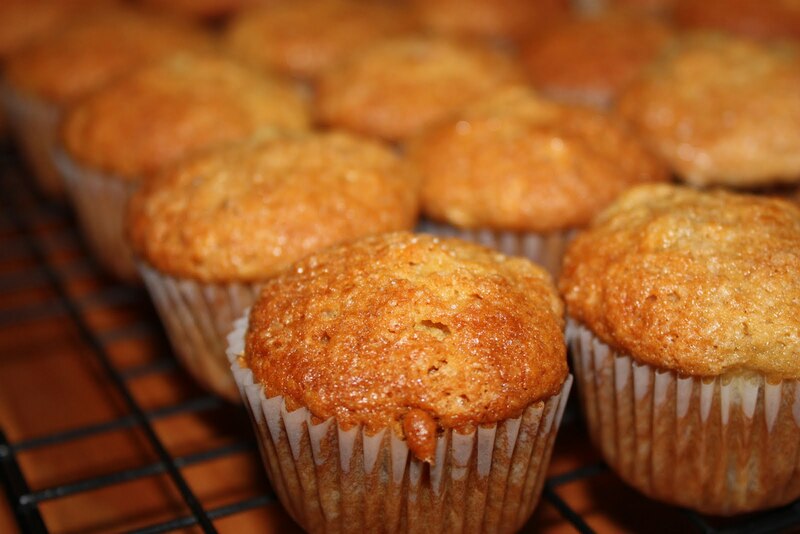 Mix together the sugar and cinnamon for the topping, and just lightly dust the top of each muffin. 7. Bake for 15 – 17 minutes, until golden brown, and enjoy! NOTES: If you want to make full size muffins, just increase the baking time to about 25 minutes. You can also add some chocolate chips, or toasted walnut pieces to these and it’ll be DELICIOUS!